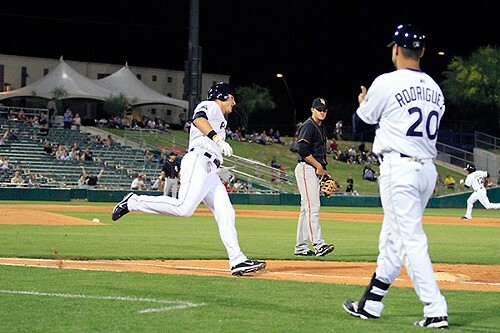 When Aaron Cunningham’s chopper rolled into left field in the bottom of the tenth inning Thursday, the Tucson Padres sealed their first extra inning win, one-run win, and walk-off win, beating Colorado Springs 8-7. Colorado Springs scored three times off Scott Munter in the top of the tenth inning, who then became the winning pitcher when the Padres scored four times in the bottom of the tenth. The stunning comeback came after an RBI single by Anthony Rizzo, a double off the top of the left field fence by Jesus Guzman, and the two-run single over the drawn-in infield by Cunningham. The Padres had a 4-2 lead entering the ninth inning, but Colorado Springs scored twice to force extra innings and give Luis Perdomo his second blown save of the season. The Padres had two runners on base in the bottom of the ninth inning, but were unable to score off Rockies’ prospect Rex Brothers, who hasn’t allowed a run yet this season. Cunningham had three hits in the game, raising his batting average from .237 to .259. After a 2-for-17 road trip in Sacramento, Cedric Hunter went 3-for-5 with a double and an RBI. Will Inman had one of his best Triple-A starts, pitching six innings, allowing only two runs to the team with the highest batting average in the PCL. The Padres are now 9-12, tied with Las Vegas for third place, three games behind first place Sacramento. Tonight, the team will be giving away 3,000 posters featuring first baseman Anthony Rizzo, who was hitting .420 with seven homes as of last night. And don't forget, baseball fans: On Saturday night, the Padres play at Hi Corbett Field for Turn Back the Clock Night. We'll be there. How about you? Details here.